Investing in Systematic Investment Plans (SIPs) have numerous benefits that range from the psychological benefit of getting into the discipline of regularly investing, to the financial benefit of averaging the cost per unit to the investor. They are regarded as the most effective medium to invest in mutual funds, and for good reason. SIPs are linked to the investor’s bank account, they automatically deduct a predetermined amount on a predetermined date towards an investment every. The default time period for a SIP investment is one month. Most investors have monthly SIPs running in their portfolio. However, a SIP can also be weekly, or even fortnightly. This basically means, instead of investing once every month, an investor can also choose to invest every 7 days or 15 days. 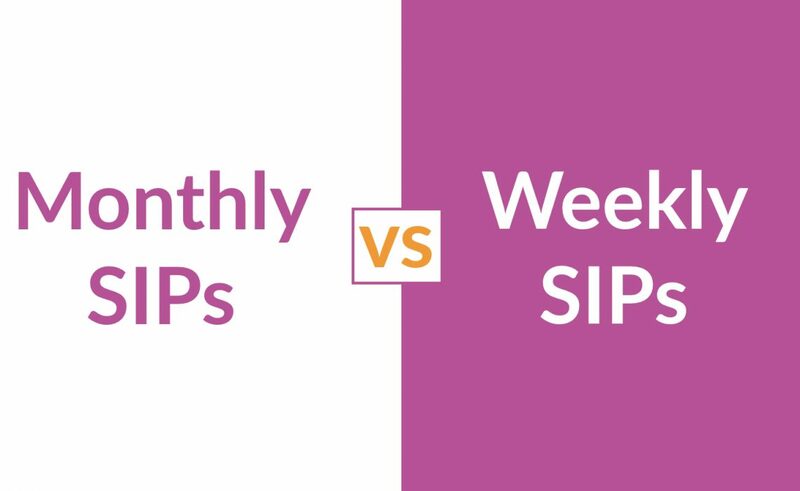 This raises an important question when it comes to executing an SIP, should you choose a weekly or fortnightly form of SIP investment? Here are some numbers that might help you better understand the new form of SIP investments. The calculations below are based on making Rs. 1,000 monthly SIP in SBI Magnum MultiCap – Growth Plan. In order to help you better understand the difference, the calculations below have been made for an investment cycle of 11 years. The investment start date is Jan 01, 2008 and the investment close date is Dec 31, 2018. Let’s take another fund to further highlight the difference of absolute returns between Weekly SIP, Fortnightly SIP, and Monthly SIP. We have chosen the Quant Active Fund – Growth Plan. We shall keep the figure same to simplify the calculations. Note: The above figures are based on the assumption that the investments are made at the start of the month in every scenario. As you can see from the above numbers, the weekly SIP plan provides the investor with higher absolute returns in the long term. SIPs are considered an important instrument to avoid risks arising from timing the market, which essentially means, by investing a small amount periodically, the risk of investing at the wrong time is substantially reduced. Weekly SIPs help investors reduce risks arising from timing the market. By investing small amounts in short periods, the risk of investing at a wrong time is substantially reduced. Weekly SIPs help an investor average their purchase cost and maximise their returns. When an investor invests small amounts regularly over a short period, irrespective of the market conditions, it helps them accumulate a higher number of units when the markets are low, and fewer number of units when the markets are high. This helps in averaging their purchase cost of mutual fund units which helps in maximising their returns. Weekly SIP is a great tool to help you achieve your financial goals. With the help of Weekly SIP, your investment amount is higher when compared to Monthly SIP, and this helps you attain your financial goals in a timely fashion. As you can see from our calculations above, the amount invested in Weekly SIP and Fortnightly SIP is higher than Monthly SIP. As you can see, with the help of Weekly SIP, an investor is able to increase his investment, without causing a strain in his monthly budget, and due to this, his returns are higher, which in turn helps him reach his financial goals effectively. Investors opt for a monthly SIP as he/she are comfortable with the frequency, as it matches their monthly cash inflows (Salaries, in particular). Monthly SIPs help them to manage and keep track of their expenses easily. However, if an investor opts for a Weekly SIP, he/she would be required to manage and track their cash flow and account balances effectively, to ensure SIP investments take place without fail. There is a general belief that, if an investor opts for a Weekly and Fortnightly SIP, he/she would evaluate their investments too often, and the short-term fluctuations might impact their investment decisions. With the help of historical data, it is understandable that Weekly SIPs and Fortnightly SIPs do help an investor achieve marginally higher returns, but it would require a disciplined investment behavior.